Apple Music is a popular streaming music service developed by Apple Inc. It enables users to access iTunes's vast library of music as well as the Internet radio station Beats 1, broadcasting live to over 100 countries 24 hours a day. Over the years, Apple Music has gained great popularity and its' customer base is still on the rise. But what disappoints us is that all the songs on Apple Music are protected in DRM, and we are limited to enjoy Apple Music songs on iTunes or its’ APP. Is there any way that we can convert Apple Music to MP3 so that we can keep Apple Music forever or transfer them to other devices - MP3 player, for example? Absolutely yes. This tutorial is going to show you the best way to stream and download Apple Music as MP3 files with the most popular Apple Music DRM removal tool – NoteBurner iTunes DRM Audio Converter. NoteBurner iTunes DRM Audio Converter is a combination of Apple Music Converter, Audiobook Converter and iTunes M4P Music Converter. It can easily remove the DRM from Apple Music & Audiobooks & iTunes M4P music and convert them to MP3/AAC/WAV/FLAC. NoteBurner iTunes DRM Audio Converter supports both Windows and Mac OS. Here we take the Windows version as an example. We've also attached a YouTube video about converting Apple Music to MP3 at the end of this article for your reference. Note: If you are a Mac user, please turn to How to Save Apple Music in MP3 Format on Mac for more details. Click the second button "Add File" on the upper left. A pop-up window will show you all the Apple Music downloaded in your iTunes Library. Choose the songs that you want to convert and then press OK.
Click the “Settings” button on the upper right and then you will be enabled to customize the Output Path, Output Formats ( MP3, FLAC, AAC, WAV), Conversion Speed, and etc. Here we choose MP3 as the output format. When the conversion is done, you can find the converted Apple Music in MP3 format by clicking the “History” button (like a clock) on the upper left or directly going to the output path you set in Step 3. 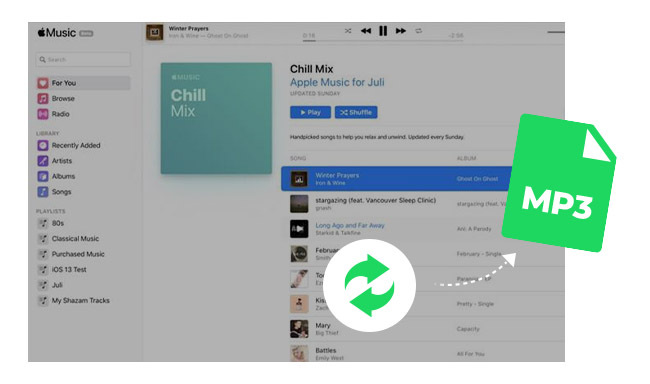 Now you can transfer your Apple Music to any other devices for offline listening anywhere anytime.